To run trials at early stages of neurodegenerative disease, researchers need biomarkers that track both disease progression and a drug’s effect on it. Blood markers would be ideal, because patients could be tested regularly with little fuss. Scientists also urgently need markers that behave the same way in mouse models and human trials. Such a marker has proved elusive, but a new study strengthens emerging evidence that neurofilament light (NfL) chain might fit the bill. In the June 9 Neuron, researchers led by Mathias Jucker at the German Center for Neurodegenerative Diseases (DZNE), Tuebingen, and Jens Kuhle at University Hospital Basel, Switzerland, report that cerebrospinal fluid (CSF) and blood levels of this protein reflected brain pathology in mouse models of synucleinopathies, tauopathies, and β-amyloidosis. Moreover, NfL responded when pathology was experimentally exacerbated or lessened, hinting at its potential to detect treatment effects. Likewise, the authors found high NfL levels in the CSF and blood of people with these pathologies. They used the same assay for mice and people, which could simplify the development of drugs from the preclinical stage, Jucker said. In the past, dozens of compounds that lowered brain pathology and improved behavioral phenotypes in animal models later failed to budge biomarkers or improve clinical symptoms in human trials. If this work holds up, researchers will be able to use the same marker in animals and people, giving them a better idea of what to expect for trial outcomes, Jucker said. “Finally, we have a readout [of progression] in a mouse model that can be used in clinical trials [for neurodegenerative diseases]. Mouse models can now likely be used in a more predictable way,” he told Alzforum. Ronald DeMattos at Eli Lilly and Company, Indianapolis, agreed, calling the results “impressive.” He was particularly struck by the correlation between CSF and plasma NfL. “The result suggests a blood-based neurodegenerative biomarker may be more proximal than what many in the field currently believe,” he wrote to Alzforum. Large-caliber myelinated axons contain abundant NfL. The concentration of this protein in CSF has been recognized as a marker of axonal injury for 20 years. For example, after boxers or hockey players receive repeated blows to the head, CSF levels of both NfL and tau peak (see Aug 1999 news; May 2012 conference news; Mar 2014 news). CSF NfL also rises in several neurologic disorders, particularly those marked by widespread axon damage such as multiple sclerosis (MS), but it creeps up more slowly in others. Some researchers have recently proposed using the marker as a diagnostic aid to help distinguish quickly progressing movement disorders from the slower Parkinson’s disease, or frontotemporal dementia (FTD) from other cognitive disorders (see Nov 2012 news; Apr 2016 conference news). In the past year, several groups have suggested NfL in CSF might be a progression marker as well, reporting that it could help predict how rapidly amyotrophic lateral sclerosis and Alzheimer’s advance, or whether PD patients will go on to develop dementia (see Jun 2015 news; Aug 2015 news; Nov 2015 news). These human progression studies, however, did not pin down a relationship between CSF NfL and neuropathology. To do this, Jucker and colleagues turned to mouse models. Joint first authors Mehtap Bacioglu and Luis Maia correlated brain pathology and fluid NfL over time in P301S-tau, APPPS1, and A53T-α-synuclein animals (van der Putten et al., 2000). 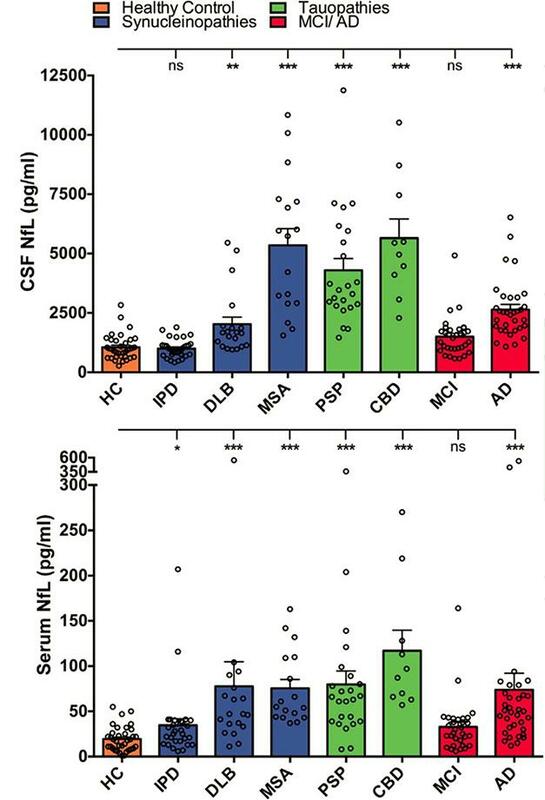 In P301S-tau and APPPS1 mice, CSF NfL rose as the first protein deposits accumulated, while in A53T-αS mice, NfL crested even before deposits appeared. Notably, in all three models NfL ticked upward months before the first symptoms emerged, suggesting it might serve as a preclinical marker. By the time symptoms developed, CSF NfL levels in APPPS1 mice were 10 times those in wild-types, while CSF NfL in P301S-tau mice was 20-fold higher, and a whopping 1,000-fold higher in A53T-αS mice. Importantly, plasma NfL followed the same pattern. It correlated closely with brain pathology and surged by a similar magnitude as in CSF. This indicates that most NfL in blood derives from the central nervous system, Jucker noted. However, absolute plasma levels of NfL were 20 times lower than in CSF, and the plasma marker did not detect early pathology as sensitively as CSF NfL did. Although increases in plasma NfL preceded symptoms in P301S-tau animals, the marker did not budge in A53T-αS and APPPS1 mice until symptoms appeared. Early data from the GENFI cohort studying genetics of frontotemporal dementia similarly indicated that serum NfL changes around the time symptoms start to appear. To test the idea that fluid NfL mirrored brain pathology, the authors manipulated deposits in two of the three mouse models. First, they seeded two- to three-month-old A30P-αS mice with brain extract from aged A30P animals. Lesions developed more rapidly in seeded mice and they lost coordination by seven to eight months, about a year before control A30P littermates did. As predicted, CSF and plasma levels of NfL rose to levels seen in aged animals, as did the number and size of synuclein inclusions. Next, the authors lowered Aβ production in APPPS1 mice by treating them with a BACE inhibitor for six months. Again, CSF NfL tracked Aβ load, with both ending up around two-thirds less than in untreated littermates. Plasma NfL fell by about 20 percent, although the difference missed statistical significance. The authors did not test behavior, nor did they have time to investigate a tau seeding model. Commenters agreed that these findings fit with other data suggesting NfL in body fluids indicates ongoing injury or neurodegeneration. “We know from trauma and stroke that NfL is a dynamic marker. When the injury response goes down, its levels normalize,” Zetterberg said. Anders Svenningsson at Umeå University, Sweden, uses CSF NfL in clinical practice with MS patients to track the success of anti-inflammatory treatment. “We see a beautiful correlation between active inflammatory activity in MS and NfL release. We look at it as a white-matter disease marker,” he told Alzforum. NfL responds so sensitively to white-matter damage that even inserting a brain catheter will cause levels to spike, while not budging tau, another marker of neuronal damage, he added. Do the mouse findings translate to human data? To investigate this, Jucker and Kuhle measured the protein in CSF and serum of people with synucleinopathies (idiopathic Parkinson’s disease, dementia with Lewy bodies, and multiple system atrophy), tauopathies (progressive supranuclear palsy and corticobasal syndrome), and β-amyloidosis (Alzheimer’s and mild cognitive impairment due to AD). Each group contained an average of 20 to 30 people. The authors found CSF NfL to be elevated over controls in all patients except those with PD, in agreement with previous studies (see Apr 2016 news). This belies the mouse data, where synucleinopathies had the highest NfL increases. However, Jucker noted that not only does Parkinson’s progress slowly, but damage is also initially confined to a small brain region, which may keep overall CSF NfL low in people with this disease and strengthen the case that NfL would be a potential marker for differential diagnosis of PD vs. atypical Parkinsonism. NfL in serum reflected the magnitude of change in CSF, and was significantly higher than control levels in all groups except PD and MCI. Overall, the NfL increase in people was smaller than in mouse models, averaging from 1.5- to 5.5-fold over healthy controls in both CSF and serum (see image above). Other researchers believe the marker holds potential for human use. Adam Boxer at the University of California, San Francisco, plans to measure CSF and plasma NfL in ongoing clinical trials of FTD patients. “It is definitely worth examining as a surrogate outcome biomarker,” he said. David Holtzman at Washington University in St. Louis agreed. “[The findings] demonstrate how [NfL] could be useful as a biomarker of neurodegeneration that could respond to therapy,” he wrote. “Clinical trials of potential disease-modifying agents should start incorporating plasma and CSF NfL to learn more about this.” Holtzman is collaborating with Jucker to measure NfL in human samples from the DIAN longitudinal study. Scientists currently look to tau as a marker for neurodegeneration and even progression, but Jucker thinks NfL has some practical advantages over the microtubule binding protein (see May 2016 news). Tau PET is expensive, measuring tau in blood is not informative because its levels barely correlate with those in CSF, and how closely CSF tau tracks progression is still unclear, Jucker said. Many questions about NfL remain, researchers said. Longitudinal studies will need to determine how the marker changes with disease progression and treatment, and how much variation occurs within individuals, Zetterberg noted. Svenningsson pointed out that NfL climbs with age and with conditions such as small vessel disease and diabetes. This could be a confounding factor in Alzheimer’s, where vascular pathology is often present as well, he suggested. Boxer speculated that NfL may not work as a preclinical marker, because some reports indicate that in ALS at least, NfL rises only as symptoms appear (see Weydt et al., 2016). Plasma measurements of NfL also need to become more robust, Boxer noted. Levels in human plasma are vanishingly small, on the order of 10 pg/ml, posing a challenge for accurate, repeatable measurements. Researchers believe they have a solution for this last conundrum. Standard ELISA methods for measuring proteins, such as the electrochemiluminescent sandwich immunoassay used by Jucker and colleagues, average the signal from a well coated with captured NfL. Zetterberg and colleagues at Gothenburg instead use a single molecule array (Simoa). This employs the same antibodies, but conjugates them to beads diluted such that only one settles in each microwell. A digital readout then counts the signal from individual molecules. As a result, a Simoa platform can achieve 25 times more sensitivity than traditional plate platforms, Zetterberg noted (for a graph see Apr 2016 conference news). Jucker and Kuhle have switched to the Simoa platform for their ongoing work with the DIAN samples. “We would like to know how early [in disease] we can see an increase,” Jucker said. Bacioglu M, Maia LF, Preische O, Schelle J, Apel A, Kaeser SA, Schweighauser M, Eninger T, Lambert M, Pilotto A, Shimshek D, Neumann U, Kahle PJ, Staufenbiel M, Neumann M, Maetzler W, Kuhle J, Jucker M. Neurofilament light chain in blood and CSF as marker of disease progression in mouse models and in neurodegenerative diseases. Neuron. 2016 Jun 9. [Pubmed].